At GoodMigrations we're on a mission to help fellow expats navigate the process of relocating to a new country. Hiring the right international mover to get your belongings to their final destination is just one part of that process. There are lots of other parts that people need help with: Which neighborhoods should you consider? What are the best schools for your kids? Who's the fastest internet provider? Which healthcare provider should I choose? We don't have all the answers, so we created the Expert Expat Program (EEP for short): hand selected expats all around the world who want to share their knowledge and experience with you! Interested in becoming an expert expat and sharing expat karma? 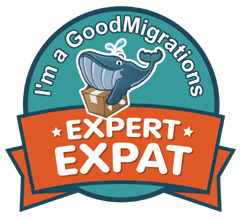 Are you living abroad and think you would be an excellent Expert Expat? We would love to hear from you! As an Expert Expat we'll link to your blog and social media accounts, and you get to include the nifty EEP badge on your blog or website. Just send us a note with a little information about yourself on our Contact Us page.